Until the second half of the twentieth century, domestic service was the largest employer of women and girls in Britain. While these domestic servants shared the experiences of class-based condescension and sexual vulnerability – features of the occupation to this day – there were differences in perceptions and treatment of them depending on which of the four nations they belonged to. These prejudices were easily identifiable among the colonies (later dominions) of the Empire to which many single British women migrated to work as domestic servants. The most prized among British servants were the Scottish. There is a nod to this perception in popular culture with two of the most senior servant positions in two of the most popular television shows depicting domestic service occupied by Scottish characters – Mrs Hughes, the housekeeper in Downton Abbey and Hudson, the butler in the original Upstairs Downstairs. Undoubtedly, Queen Victoria’s love affair with Scotland and reports that she, “like many of her loyal subjects, believe[d] thoroughly in Scottish servants” bolstered the notion of their pre-eminence. Other than their reputation for being faithful, trustworthy and respectable, they were also known to have a “natural intuition for domestic work”. Unsurprisingly, employment agencies in Canada and Australia held them in high esteem for “their assumed stalwartness and reliability”, and for being well-suited to country work. Notwithstanding the presumed virtues of the Scottish servant, English migrants often professed loyalty to their own. May Jackson, in writing to Brisbane’s Daily Mail in 1922, claimed that a “good English servant has her equal nowhere on earth”. Many English-born Australian wives echoed her belief in their stated preference for English girls when requesting servants through migration-assistance bodies like the New Settlers’ League. According to Mrs Kenneth Street, England was the place where “domestic workers reach the highest level of efficiency”. However, some Australians felt English servants were utterly unprepared for the kind of work that awaited them, especially in the more rural parts of the country. 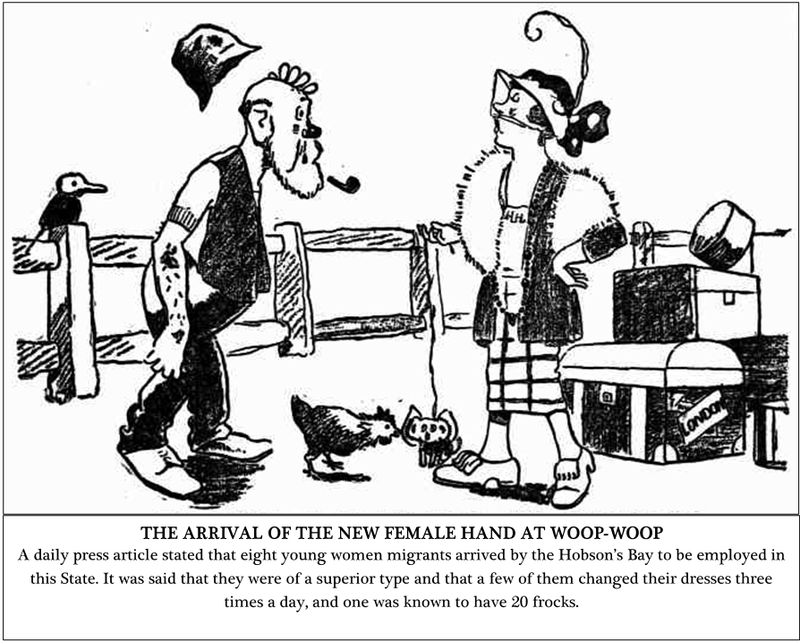 While this 1923 cartoon from the West Australian Sunday Times does not specify the new arrivals as English (though, statistically, some likely were), the one below from Sydney’s The Sun does, and continues along the theme of the migrant servant as “a superior type”. It also derides migrants’ complaints about the conditions of their employment, while alluding to the fact that their passage from England had been subsidised – in whole or in part – by the Australian taxpayer they were there to serve. The mockery of the English migrant servant pales in comparison to the prejudices against those of Irish descent. Anti-Irish sentiment in Britain centred on the Catholicism of the migrants, exacerbated by the many poor Irish folk flocking to English cities to escape the effects of the Great Famine in the 1840s. They were often represented as lazy, untrustworthy and, simply, undesirable. The specification that “No Irish Need Apply” for job vacancies followed Irish migrants to the outposts of the Empire. In the latter part of the nineteenth century, Darwinian theories of evolution were used to give scientific credence to the perception of Irish inferiority. The Irish were perceived as race unto themselves, imagined as slightly darker in complexion, and subject to the subtle but enduring corollary between darker skin and being unclean/dirty. 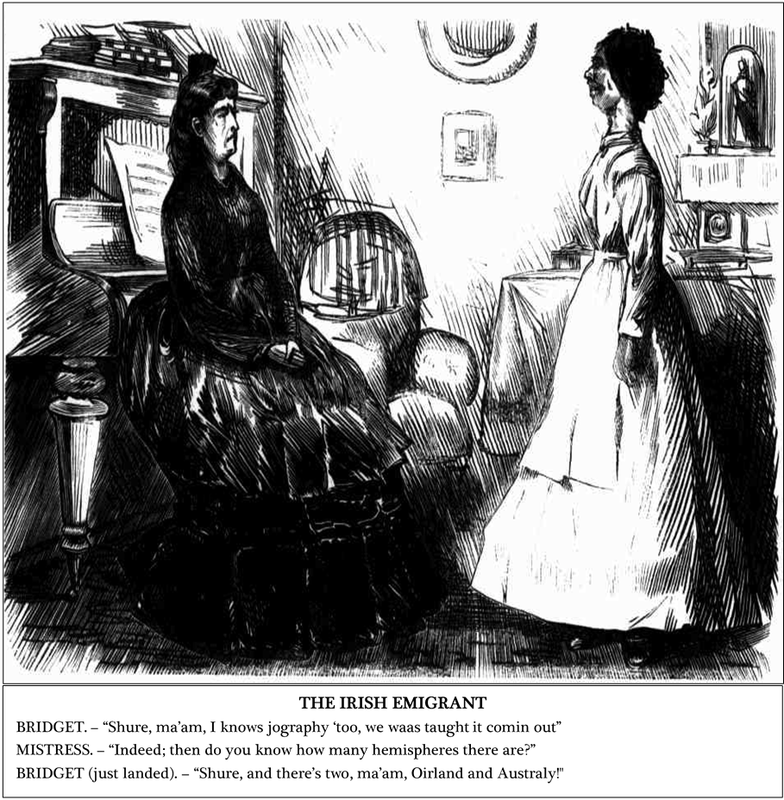 This is evident in this 1872 representation of a newly arrived Irish emigrant in the Melbourne Punch. 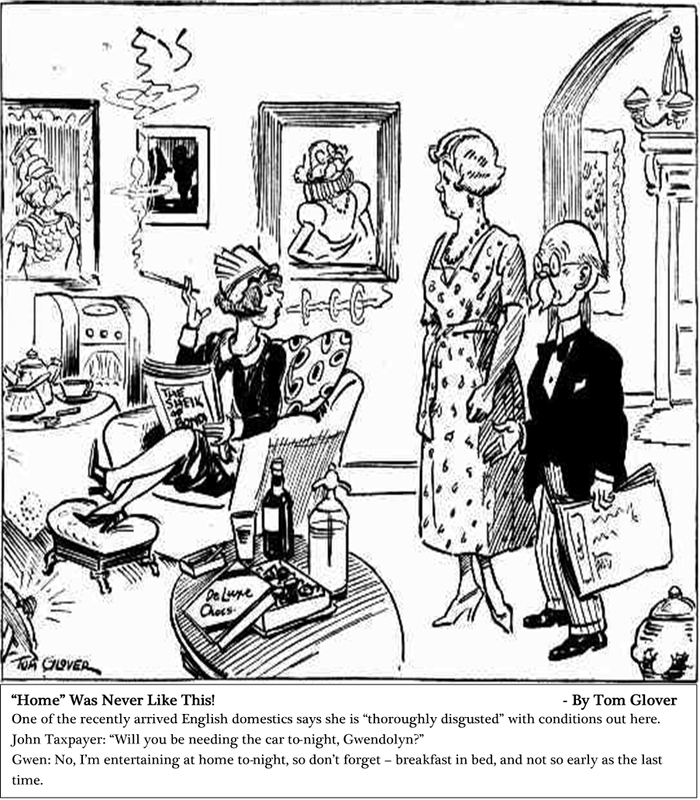 As this cartoon also shows, low intelligence was seen as the hallmark of supposed Irish inferiority. The Irish as employees were often described or depicted as slow, stupid or dim-witted. Fifty years after the cartoon was published, just as the Irish Free State was established, that bias still saw the dumb Irish Bridget as a legitimate trope. Stereotypes of Welsh servants were not nearly as scathing as those of the Irish, and they were rarely singled out in migrant communities. In serialised newspaper stories, the Welsh servant was either middle-aged, plump and of a jovial disposition or young and naïve, but usually quite pretty. The political rise of the Welshman, David Lloyd George, in the early decades of the twentieth century saw a greater spotlight on the Welsh in English society. His political opponents called for boycotting all things Welsh, including servants, while his wife weighed in on the plight of Welsh servants in England. Depressed economic circumstances in Wales during the early 1930s saw a large influx of its young women and girls into London, seeking work as domestic servants. They were, reportedly, prone to loneliness and isolation (with some claiming this resulted from their tendency to speak only Welsh among themselves), and had been known to steal for the money needed to return home. As a result, one judge expressed the opinion that Welsh girls were “particularly prone to thieving”, causing understandable uproar in Wales. Domestic servants were looked down upon and, often, worked under appalling conditions. This treatment, resulting from the double prejudice of class and gender, could either be worsened or alleviated by the servant’s origins within the British Isles. Many of these preconceptions were echoed throughout the Empire and were not held only by the servant-employing classes. As is the inherent nature of bias, “evidence” could always be found to confirm either negative or positive prejudiced notions. Servants, given the isolation of their jobs, their subservient position, level of education, and the fact that prejudice can be so insidious, were hard-pressed to respond meaningfully when confronted with such powerful preconceptions. “Ladies Chitchat.” The Week (Brisbane), 7 December 1894, 3. “Scottish Girls Best.” World’s News (Sydney), 4 June 1930, 15. Rebecca Manusco. “‘Give Me a Canadian’: Gender Identity and Training Hostels for British Domestics for Canada, 1927-30.” The Journal of Imperial and Commonwealth History 38, no. 4 (2010): 606. 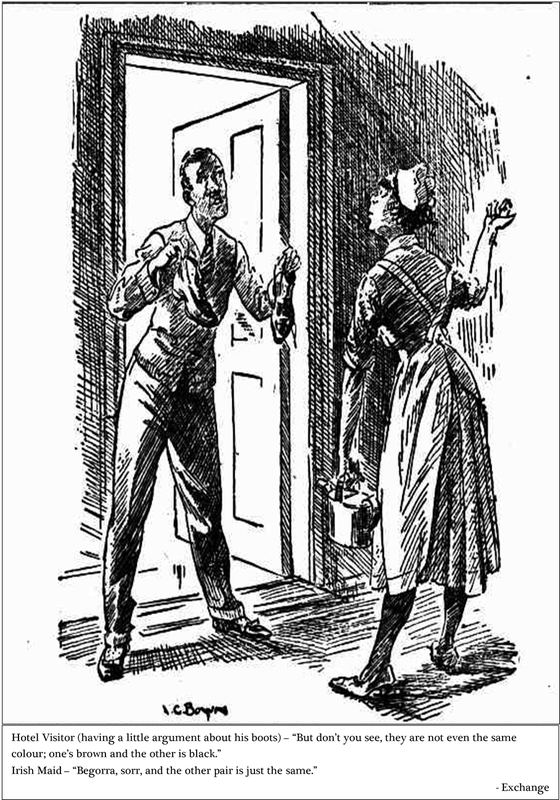 “Domestic Girl Problem.” Daily Mail (Brisbane), 10 April 1922, 8. “Trained Maids are Scarce…Why?”, The Australian Women’s Weekly, 9 June 1934, 27. Donald M. MacRaild. “‘No Irish Need Apply’: The Origins and Persistence of Prejudice.” Labour History Review 78, no. 3 (2013): 286. Hamilton, Paula. “‘No Irish Need Apply’: Aspects of the Employer-Employee Relationship, Australian Domestic Service 1860-1900.” Working Papers in Australian Studies 1 (1985): 1. Mari A. Williams. “‘The New London Welsh’: Domestic Servants 1918-1939.” Transactions of the Honourable Society of Cymmrodorion 9 (2003): 145. Elmarí Whyte is in the final year of her doctoral studies in History at the University of Queensland, Brisbane. Her PhD thesis takes a comparative view of domestic service in Australia and Britain from 1914 to 1945. This entry was posted in 19th century, 20th century, Britain, Empire, England, Identity, Ireland, Press, Victorian, Wales and tagged Domestic service, Downton Abbey, Emigration, England, Gender, Immigration, Ireland, Migration, Queen Victoria, Scotland, Servants, Stereotypes, Upstairs Downstairs, Wales. Bookmark the permalink.